©Benedicte Kurzen/NOOR for FAO24 October 2018, Beijing — Planted forests can help with efforts to achieve sustainable development by meeting the increasing demand for timber and forest environmental services such as carbon sequestration, according to a keynote address delivered today by FAO Senior Forestry Officer Daowei Zhang during the 4th International Congress on Planted Forests held this week in Beijing. Zhang noted that policy instruments, such as forest governance and administration, secure property rights and stumpage prices, are being used to influence the development of planted forests and this is helping to meet the growing demand. Zhang provided detailed examples from four countries on four continents — Brazil, China, France and the United States — that collectively, account for more than 40 percent of planted forests globally. During a congress side event focused on challenges and opportunities related to the joint initiative of the Collaborative Partnership on Forests, Sustainable Wood for a Sustainable World, FAO Forestry Officer Benjamin Caldwell explained how planted forests can contribute to sustainable wood production and livelihoods. 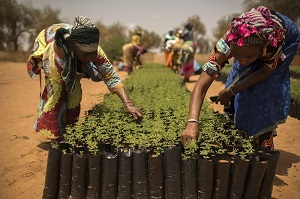 According to Caldwell, planted forests must be designed, developed and responsibly managed based on relevant FAO principles that include good governance, transparency, and landscape management. The Sustainable Wood for a Sustainable World initiative aims to strengthen sustainable wood value chains by enhancing their social, economic and environmental benefits in order to ultimately contribute to the attainment of the Sustainable Development Goals. Several of FAO’s partners in the initiative participated in the congress side event, including New Generation Plantation, a web forum on land-use issues managed by World Wildlife Fund International; pulp and paper manufacturer Stora Enso; the New Zealand research agency Scion; and the Center for International Forestry Research (CIFOR). As an example of the positive role that planted forests can play in the forestry sector, Caldwell discussed the Sawlog Production Grant Scheme, a five-year European Union-funded project implemented by FAO in Uganda, The scheme provides financial grants and technical support to commercial tree planters, rural communities as well as public and private institutions as a means of promoting investment in commercial tree planting and increasing incomes of rural populations. The International Congress on Planted Forests, an academic conference, is organized by the Chinese Academy of Forestry, with technical support from the International Union of Forest Research Organizations (IUFRO), FAO through its Planted Forests Programme, and the National Forestry and Grassland Administration of China.